While downloaded MP3s and streaming services such as Pandora have gained traction amongst consumers, radio is still a popular solution to many. More recently, HD Radio has been gaining more buzz as it offers CD quality audio, but with no monthly fees unlike Sirus XM Satellite Radio. I’ll be discussing the HD Radio service and the Insigina Portable Player that iBiquity, the company behind HD Radio, was kind enough to grant us. Founded in 1998, iBiquity Digital Corporation set out to create an In-Band On-channel (IBOC) digital radio broadcast system and today their product is called HD Radio. The technology offers a variety of benefits over the traditional analog radio. The receiver converts an analog radio wave signal into a digital one and even provides Program Service Data (PSD) such as a song’s title, artist, and album. If you are tuned into a weather or traffic station, it can even display condition alerts or simply a text advertisement during a commercial break. The most noticeable benefit is the FM sound quality which gets a jump to CD-like quality while AM stations sound like FM stations. Audio quality is rather quite dynamic and clear, the quality generally associated with physical media. That’s because digital signals have fixed precision, factors such as temperature, interference, or weather won’t degrade the quality as easily. Plus as a bonus, the HD Radio can easily fall back onto the analog FM broadcast version of the same station if it happens to fail to establish a connection. The HD Radio technology let’s stations broadcast a digital version of channels of their choosing over the same frequency without effecting the respective equivalent analog transmissions. HD Radio states they have over 2,000 stations across the country and over 1,000 HD2/HD3 channels. If you haven’t heard of HD2/HD3, it’s a method to let broadcasters transmit multiple streams on the same frequency. Supporting receivers can tune into channels that aren’t normally accessible to analog devices. HD Radio’s website stated that there would be about 36 channels including HD2 and HD3 in the Sacramento, CA area. I managed to find around 10 from Davis, CA including those multi-cast channels. iBiquity has also opened the doors for more HD Radio features. For example, if the receiver manufacturers wish to do so, starting this year they’ll be able to integrate Album Artwork and have it automatically display while a song is playing. 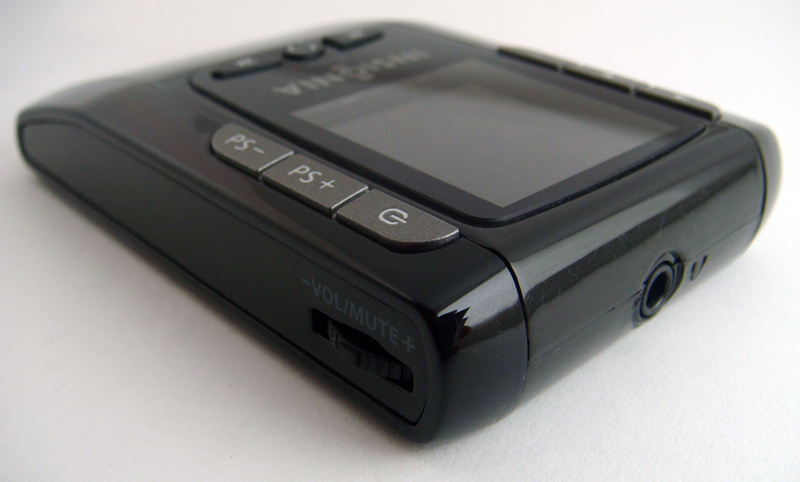 Devices such as the Microsoft Zune HD already support pausing live content. With support for Electronic Program Guides down the road, customers will have a TV Guide type interface to browse for content. For the most part, I think HD Radio is on the right track. Their technology better integrates into existing infrastructures for stations versus Satellite Radio. While channels selection is still limited, it’s expanding quickly. Newer vehicles are likely enabled with equipment to support HD Radio stations. Unfortunately, your existing systems such as home theater receivers, audio systems, and portable devices will need to be replaced to receive HD Radio content. While I’m not going to go out of my way to go buy a dedicated HD Radio players, as the time to upgrade old equipment comes, I’ll like lean towards this over XM Sirius since there’s no monthly fees asides from the one-time equipment price. 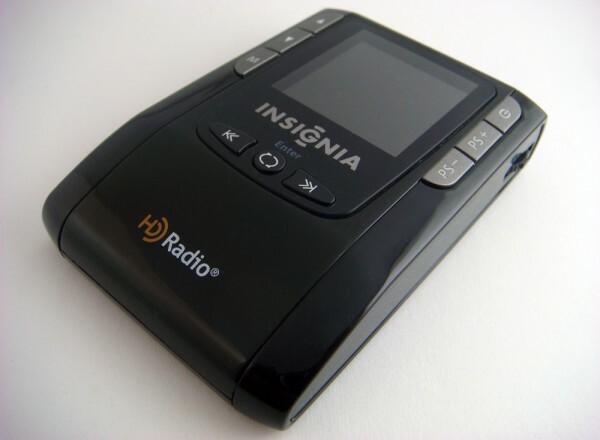 The device we used to test the HD Radio service was none other than Insignia’s portable player. I expected a fairly decent device, but was rather presented a cheap looking device from the 1990s with large plastic buttons and a low quality LCD display. To be fair, it only costs about $40 versus the $250 price tag of a Zune HD that can also access the same channels. 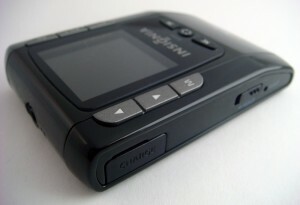 The Insignia player has a very simple and somewhat ugly-looking interface. It’s actually quite reminiscent of an early color cell phone. The controls are rather awkward and there are more buttons than probably needed. The display shows signal strength at the top left and will also show an icon when tuned into a HD station. I could quickly navigate trough stations using the up and down keys or use the auto scan feature to find the next channel with signal. Switching through HD stations had a noticeably larger delay than standard FM stations. Fortunately, the preset feature let me save 10 stations to speed things up. There’s a 3.5mm headphone jack at the top and Insignia included a pair of headphones, which is needed since it’s the antenna. While the buds sounded about on par with the famous iPod headphones, I would still recommend grabbing a better pair. This unfortunately also means that reception will likely be poor if plugged into an AUX jack of a car since there’s no antenna. Despite the complains, I should mention that the audio quality was drastically superior to standard FM music stations. I didn’t feel like I was listening to radio which usually has a noticeable ring to it, but rather my own tunes. Insigina includes an arm strap for joggers which was quite handy. I was disappointed to learn that they didn’t include an AC adapter, but rather only a mini USB cable for recharging with a computer. Unfortunately, I was further enraged to find that the device entirely lacked AM channels. Considering that cheap radio tuners cost just a few bucks and are often stuffed into free giveaway pens and trade shows, I don’t think it would have hurt to include AM. This leads me to a tough call about the Insignia HD Radio player. While it’s one of the few affordable portable devices that can receive HD broadcasts, it’s still simply not worth it. I wouldn’t recommend spending $40 for a device such as this one, but rather save up to purchase a Zune HD. A more widely supported device will last longer and offers numerous features I could spend a few articles discussing. But that said, the HD Radio service is a great addition and is truly the next step to the current aging infrastructure of AM and FM channels. Editor’s Note: This article was co-written by Alex Chan-Kai and Sahas Katta. HD radio – What a Waste of time. I don’t think it’s a waste of time – a lot of people still get their music fix from the radio. I’m somewhat of an audio purist (but won’t fall for audio snake oil),and I do enjoy the clarity of HD Radio (although I am glad that Skattertech didn’t confuse HD Radio for High-Definition Radio – it stands for Hybrid Digital Radio) over standard radio. That being said – I think a device only dedicated to radio these days, at MSRP, is dated. I agree with you Jon. The only time I find myself listening to the radio is when I’m driving. While I sometimes use Pandora with my mobile device’s 3G for quality content, radio is still somewhat easier. Especially if you don’t have a nice HDD based player built into the car or good support for external devices. I had a trial for XM Radio for about 6 months and I loved the quality of the music. Unfortunately, I wasn’t someone who would be using it nearly enough to justify paying a monthly fee. On the other hand, HD Radio is a great mix. Same free stations, but in higher quality. While older cars will need to get new equipment, new ones likely have HD Radio already in it. HD radio is a joke. It’s growth is so slow and forced and it will obsolete millions and millions of radios for no other purpose then the feed the greed of big business. With the exception of few people (mostly radio insiders) the general public has virtually no understanding of what HD radio is. So how could they know they even want it? transition the receiver makes this screech noise that sounds like the receiver isn’t resolving the digital signal correctly. When in full digital mode the high frequencies are so dirty sounding, I guess due to the slow bit rate, that I have to ask myself, what’s the point? When it goes back to analog the signal cleans up and sounds great. Tell me again why would anyone want this? what a unfamous blog! !alexa rank of your blog-#140,147…..
and very less comments in most of the posts….